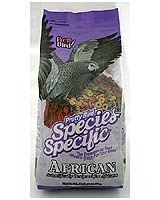 This formula contains 14% protein and 8% fat and is the ideal food for all African species and for medium and large Conures. This formula, in our medium-sized morsels, offers a readily available source of calcium that is required by the African species. Corn, Oats, Corn Gluten Meal, Wheat, Potato Protein, Soya Oil, Coconut Oil, Calcium Carbonate, Dicalcium Phosphate, L-Lysine, Choline Chloride, Natural and Artificial Flavors, DL Methionine, Isoleucine, L-Threonine, L-Tryptophan, Vitamin E Supplement, Ascorbic Acid (Vitamin C), Ferrous Sulfate, D-Biotin, Yucca Schidigera Extract, Zinc Oxide, Manganous Oxide, Niacinamide, Magnesium Oxide,Vitamin B12 Supplement, BHT ( as a preservative), Copper Sulfate, Calcium Iodate, Calcium Pantothenate, Vitamin A Supplement, Sodium Selenite, Folic Acid, Riboflavin, Pyridoxine Hydrochloride, Thiamine Mononitrate, Natural and Artificial Colors, Menadione Dimethylpyrimidinol Bisulfite (source of Vitamin K3), Vitamin D3 Supplement, Cobalt Sulfate. Crude Protein (min) 14%, Crude Fat/Oil (min) 8 %, Crude Fiber (max) 5%, Moisture (max) 10 %, Ash (max) 4 %, Vitamin A (min) 17,500 IU/kg, Vitamin D3 (min) 800 IU/kg, Vitamin E (min) 200 IU/kg, Copper (min) 10 mg/kg.